Salvation And Survival: How Do You Worship The Lord? How Do You Worship The Lord? This may seem like a rather vague question, or even one that seems obvious to most Christians who are active in their Church. But I don't want you to answer it based on the customs and traditions practiced in your denomination. You see, that is corporate worship, and I'm more concerned about how you worship Him individually. Because, it is my opinion that God is more interested in how you worship Him and His Son on the personal level. As with so many principles of our faith, Worship can become ritualized and defined by a set of man-made traditions. How many of you had this thought when you first considered my question ... "Worship should include corporate song and a time where our voices are lifted to the Lord in praise and thanksgiving"? Nothing wrong with that answer, at all. But do you limit the concept of worship to that idea, or is it your viewpoint that worship must [or should] always include a corporate display in song? I know that this is a common impression of what "worship" is in the modern Church. But let's take a look at how worship is displayed in the Bible. Both the Old Testament Hebrew word (shâchâch) and the New Testament Greek word (proskuneo) for worship define it as "a gesture of obeisance (respect, homage, adoration, reverence, veneration, honor, submission, deference) towards God". This gesture was often displayed by bowing down in homage to God as a superior ruler. But, as we know, worshipping God is so much more than this singular act of acknowledgment and recognition. To me, worship is the result of the state of your spirit. It originates internally, in response to your spirit's relationship with the Father. It is an individual and personal act of recognition of our Creator; an expression of our awareness of our identity as a son or daughter of God. And it is that individuality of our worship that I think has been somewhat lost by modern Christians. We tend to define worship by corporate standards, and even though our church services have set aside a time for the Body of Christ to sing and lift their voices to God in worship, it is the individual hearts that He is listening to. External actions are of less importance to Him. So, the attitude of our hearts and spirit is the origination point of our worship, which is then acted out in some form of reverence, praise, and honor. It doesn't have to fit a specific model or be the same for everyone. 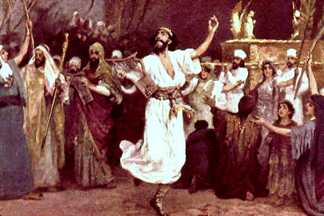 I love how, in 2 Samuel Chapter 6, the Bible says that "David was dancing before the Lord with all his might". Now that is worship; it shows the attitude, or position, of his heart. And you know he was dancing in his spirit, too! David's form of worship was total and unrestrained -- completely unself-conscious, and personal. He didn't care what others thought, nor followed a prescribed format. In fact, Michal, King Saul's daughter, and David's wife, scorned David for wearing a linen ephod, which is a priest's upper garment, while he danced before the Lord. From the research I've done, the condemnation came because this garment was form-fitting. He wasn't dressed the way Michal thought he should be, and apparently she didn't think his actions were befitting a king. I would agree -- David acted out of a child-like love for the Lord, with no inhibition, and pure joy. And all that Michal could see was that it didn't fit the structure of established worship. Are you more like David or Michal? I think in order to answer that question, we must ask ourselves if we care about what people think -- are we trying to please God, or other Christians? I have to admit that I have seen a great change in my husband as he worships with God-centered people who follow no set agenda for what worship should look like. For years, he simply didn't enjoy singing hymns in a church service, and it just didn't move his spirit. But, I have seen him in more relaxed settings, with a guitar player singing original songs that praise our Lord, and people even dancing in the aisles, hands raised high. Unconventional? Absolutely! But I suspect that this is closer to how King David worshipped in his personal style. Does that mean that hymns sung in church services constitute less meaningful worship? Of course not. I have heard beautiful hymns sung by choirs, and soloists that have moved me to tears as my spirit responded. I am in no way declaring that one style of worship is better than another. I can only speak for myself and I never want my worship to become regimented or stale. I want the expression of my worship to grow and expand, and I never want to become so self-conscious that I opt for playing it safe. I want my worship to be heartfelt and spirit-led; reverent, yet abandoned to new heights of adoration. So, I come back to my original question ... How do you worship the Lord? If it is confined to corporate worship in a specified format, I pray that your individual heart and spirit are sending praise soaring to the throne room of God. And if you find yourself dancing with all your might before the Lord because your spirit cannot be confined in your expression of homage to our Lord, then that's okay, too. And if the Holy Spirit leads you to spend time in silence with Jesus, meditating on all He has done for you, then that is worship, too. Do not let anyone limit you as to what form of Godly worship is acceptable. Worship is individual and it is personal. The Lord recognizes all worship that is centered on Him and His glory. However you worship Him, just do it with great enthusiasm, as is befitting His Majesty. Psalm 71:8 "My mouth is filled with Your praise, and with Your glory all the day." Thanks Pam. For a long time I have wonder why we put so much emphasis on corporate worship, if in fact, our relationship to God via Jesus Christ is personal...likely we worry too much about man thinks with adhering to so many traditions that are man-made, and man-centered. Yes, and too often, that corporate worship can become an idol in itself. True, heartfelt corporate worship is pleasing to the Father, but how many people are truly invested in that moment? Or has it just become a part of the ritual of Sunday mornings? Worship as your hearts lead you!